As I wrote in my last post, I’m back doing the thing I apparently can’t stay away from: social media management. You know, the job I so melodramatically quit almost four years ago, then have spent the time since attempting to move on from before finally just realizing that, for all its franticness (that’s a word, right? )–or maybe because of it–it’s what I love to do. The thing that has struck me the most as I’ve spent the past month getting up to speed in my new role is how dramatically the job has changed over the past almost decade that I’ve been “doing” social media. 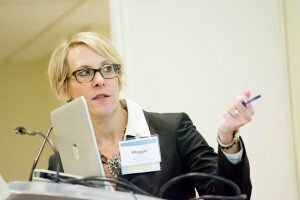 Back in 2009, Social media management was a new enough job in the association sector to warrant this article by Maddie Grant in Associations Now magazine. 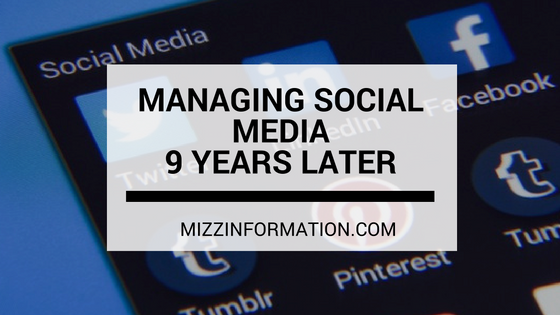 Back then, social media was as buzzy a topic in the association world as cybersecurity and big data are today. I feel like social media grandma now, thinking back to what the job entailed back then. That was back when Facebook was still relatively new for brands and certainly new for associations. Back when you could create a page for your organization, promote it by going to a few walls and posting “we’re on Facebook!” and, a month later, have 10,00 fans. And back then they were called “fans.” It was also before pages had vanity urls–I still remember staying up until midnight the night they first rolled out vanity urls, poised to grab our org’s name. That was also back before Facebook had any kind of notification system for page comments or interactions–you had to just be on Facebook, continually refreshing, to watch for new comments and posts. I’ll spare you the rest of my stroll down social media memory lane, but suffice it to say the social media landscape back then looked a lot different than it looks today. Which brings me to today. One thing is for sure when it comes to social media jobs–“lifelong learning” is not optional for this job; I can’t think of any job that, over the course of just a year or two, requires you to learn entirely new skills in order to do the same job. Back in 2008, there was blogging and then Facebook, Twitter and LinkedIn. Then Google+ came…and went, for the most part. Then Pinterest and Instagram and suddenly you had to have graphic design and photography skills to do the job that previously involved only, for the most part, words. Now just knowing graphic design and photography seem like a piece of cake compared to what you’ve got to master today–now that livestreaming and podcasting are the things, you need to add video and podcast producing to your resume. And not just holding up your iPhone and pressing “record”–you need to know video editing, sound mixing, and how to livestream across not only Facebook but YouTube and now Twitter…oh, and Instagram. And of course ad buying across all these platforms because paid advertising is now part of social media strategy and will only become more so as pay-to-play becomes a bigger and bigger piece of the social media pie. Then there are bots. My head is still wrapping around this one, but I can already see the potential for associations…as well as yet another skill set social media managers will need to acquire on the fly. Does your association offer courses or events and also host a group on LinkedIn? 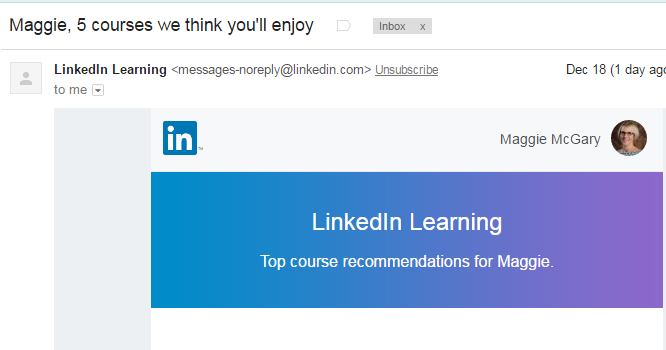 Then this is eventually the email that your members will be receiving from LinkedIn learning, announcing new courses on the exact topics your org covers and offers content on, either online or at face-to-face events. Because think about it–we, associations who are assembling networks of professionals specializing in every imaginable field on LinkedIn’s Group platform–are doing all the work of putting together their future target audiences for their “learning paths.” Anyway, I’ll digress on that…but seriously…it’s already happening and will only continue to happen more as LinkedIn continues to invest in this part of their business. Great post Maggie. Thanks for sharing.